Home > GPS Personal Tracking Systems > MT-100 Tracking Device for Motorcycles Free USA Ground Shipping! TrackingTheWorld’s MT-100 tracking device is specifically designed for motorcycle tracking and other applications requiring outdoor exposure and low power consumption. The MT-100 tracker provides the efficiency, durability, and technological advancements users need in a motorcycle tracker, and offers more features than other trackers in the same price range. 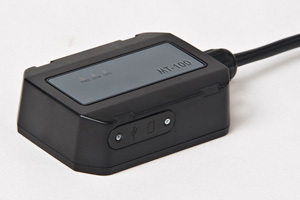 The MT-100 eliminates common problems associated with motorcycle GPS trackers and excessive battery drain. The device features longer standby times, less power consumption while active, and NO power use when the ignition is off. The MT-100 provides users with faster time to first fix (TTFF), Quad Band GSM frequencies 850/900/1800/1900, and water resistance to IPX-6 standards. The MT-100 is equipped with the sophisticated UBlox chipset, is compatible with a wide range of operating voltages (8-32 V DC), and includes an integrated GSM/GPS antenna. TrackingTheWorld’s MT-100 tracking device includes a built-in backup battery, geo-fencing capabilities and more.